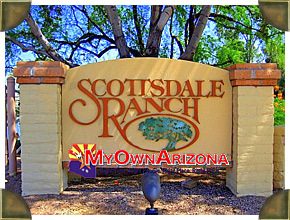 Welcome to the online MyOwnArizona team presentation of Homes For Sale in Scottsdale Ranch. Search our collection of the finest Scottsdale homes, estates, and land for sale in the North area. The City of Scottsdale has some of the finest luxury homes and estates available in the entire country. The Scottsdale real estate market benefits from one of the largest and fastest growing metropolitan area’s in the entire region. The Scottsdale area boasts plentiful luxury shopping, dining, and outdoor opportunities, which are listed for your convenience in our Scottsdale Luxury Resource Guide. Please contact us to receive the luxury packet on Scottsdale Ranch. Scottsdale Ranch is a master-planned community developed in 1984 and has become a primary and accelerated community promoting original lifestyle choices. Scottsdale Ranch is comprised of four thousand residents located in 40 varied subdivisions, all expressing individual tastes, from grand waterfront Scottsdale Ranch homes for sale and large tennis Scottsdale Ranch villas, to Scottsdale Ranch patio homes, Scottsdale Ranch townhomes, spacious family homes. As part of Phoenix's northeast growth plan, Scottsdale Ranch was rezoned in 1979, and offers from small independent units to acre lots to multi-family at 16 units. The Scottsdale Ranch development is located on over a thousand acres and facilitates a forty-two acre lake that was developed by Scottsdale Ranch, the City of Scottsdale, Maricopa County and U.S. Army Corps of Engineers. Lake Serena is included in the Indian Bend Green Belt System. It's the “jewel” in the desert that provides many hours of tranquility and enjoyment for Scottsdale Ranch residents. Located in the heart of the community is the Scottsdale Ranch Park. The Scottsdale Ranch Park is a 64-acre general public use area that was donated by the developer to the City of Scottsdale.